I don’t get red velvet cake. I never have. I just don’t see the appeal of slicing into a pristine confectionary delight only to be confronted with an interior of nearly blood-red dessert. Sure, red is the color of romance, but…seriously? Seriously??? Sanguinary sweets just don’t do it for me, I’m afraid. 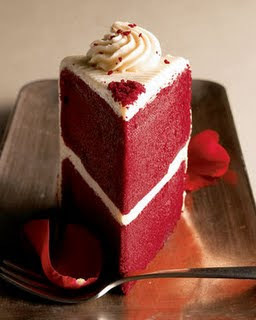 On the other hand, before my husband died, he was absolutely addicted to red velvet debauchery. Ned could consume half a cake in the space of twelve minutes, if left to his own devices. It was certainly a sight to behold, and one that made an episode of CSI look like the Powerpuff Girls in comparison. Crimson streaks smeared across an empty plate – while I was pregnant with Kylie, the sight literally turned my stomach. After one such incident spent over the porcelain bowl, I begged Ned to desist – at least until after the baby was born. In return for this chivalrous sacrifice, I baked him a three-tiered red velvet masterpiece a few weeks after Kylie’s birth. Hi, I'm Sadie Spencer , and this is my blog. I'm from Hershey, Pennsylvania, where I manage the restaurant I own: Suncatchers. My passion is food and my precocious daughter, Kylie. If it wasn't for my best friend, Jasper, I don't know how I'd make it through most days! Trouble seems to follow me around like bees to honey. At least it's never dull. On the contrary, sometimes, life can be pretty sweet. But what else do you expect when you live in the town of chocolate? Copy the code to showcase this blog button on your own site!